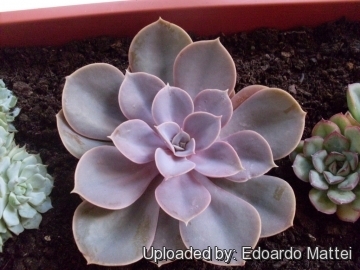 Description: Echeveria "Perle von Nurnberg" is a hybrid of Echeveria gibbiflora v. metallica and Echeveria potosina. It is a slower growing small cultivar with nice waxy pearly-purple/bluish coloured rosettes, that offsets to produce a clump, spreading to around 30cm wide . The purple metallic blush is fairly consistent throughout the seasons. Higher light and heat seem to increase the purple a bit, though. Rosettes: Medium sized, gets about 15-20 cm in diameter at the most, usually a bit less. Leaves: Broad in a tight rosette overlapping each other, with concave upper surface, semicircular to somewhat triangular with tiny pointed tips. They have a mauve ting with a silvery sheen and change shades with the seasons. Flowers: It produces gracefully arching flower spikes up to 40 cm long. The flowers are a delicate coral colour. The outstanding feature of this species is the quantity of flower stems that it produces, with sometimes half a dozen or more being produced on one rosette. Blooming season: Blooms appear during the spring months or in late summer. 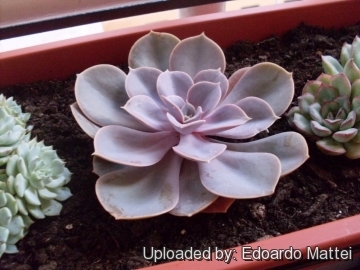 Cultivation and Propagation: Very easy and reliable plant it can stay outdoors in summer, in mild climate it can grows in the garden where it takes lots of water without rotting. It is relatively slow growing and very slow to sucker (if at all). It prefers a bit of afternoon shade but does also well in bright light with high heat situations. It is however adaptable to low light situations too. 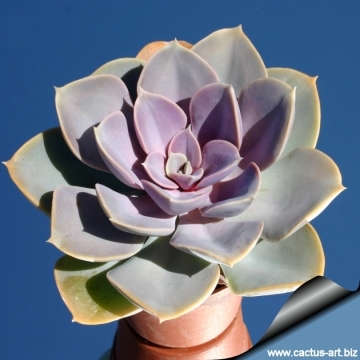 Plant in fertile free draining soil or a cacti well-drained mix. Water well during the warmer months, preferably from below, and sparingly in winter. Hardy hybrid tolerant of a wide range of conditions including some frost. The flowers spike sometime wilt because the rosette is almost drained of moisture, and may wither badly. Early removal of the dying flower stems will prevent this being aggravated by the production of seed, which of course will have the same effect, since the flower stems stay turgid for some time to support the seed production. 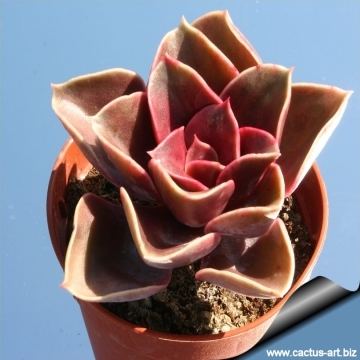 Uses: Beautiful succulent for container planting adding colour to mixed collections. Excellent for windowsills or as colour accent in rock garden or dish garden. Ideal for adding dramatic foliage contrast to garden beds and borders and colour to the winter garden. 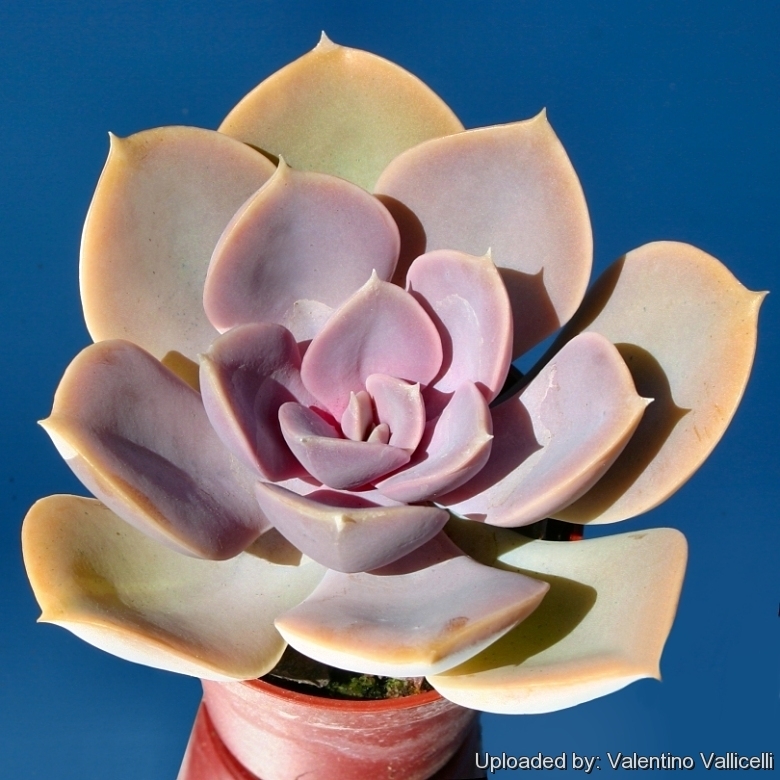 Propagation: Usually by suckers or basal leaves, if If the plant is repotted some of the bottom leaves can be removed, in order to attempt leaf propagation, it is also a common practice to collect the leaves on the flower stem. However many such cuttings will dry out without producing a plantlet, but with perseverance it is likely to get a few new plants.